"Shaer treats the composer's allusions by "reading" both the musical and the literary texts: Asking questions, providing answers, leading dialogues, meditating, narrating or being impulsively enthusiastic. Ideas that seem as though they develop at the very moment give his interpretation of the piece a persuasive originality". Having performed in numerous concerts throughout the world to great critical acclaim, Ishay Shaer is quickly becoming one of the leading pianists of his generation. His recent performances include, among others, recitals at the Tonhalle Zurich, Queen Elizabeth Hall, the Purcell Room, Nottingham Royal Concert Hall, UK; Warsaw Philharmonic Hall, Poland; deSingel, Belgium; Preston Bradley Hall in Chicago, USA; Sala Sinfonica Pablo Casals in Puerto Rico, Sala Sao Paulo, Brazil, and Teatro Solís, Uruguay. 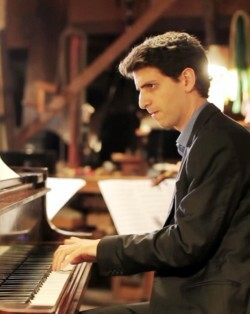 He has taken part in musical events such as Montreal Bach Festival, Gdansk Music Festival, Swansea Festival of Music and Arts, Dr Anton Philipszaal piano series (Netherlands), Dame Myra Hess Memorial Concert Series, Sociedad Filarmónica de Lima, Semanas Musicales de Frutillar, Fundación Beethoven (Chile) and Israel Festival. In addition, he has performed as a soloist with the Israel Philharmonic Orchestra, BBC National Orchestra of Wales, Orquesta Sinfónica de Navarra, Orquesta Filarmónica de Málaga, Orchestre de Chambre de Lausanne, the Brandenburgisches Staatsorchester Frankfurt, Orquesta Sinfónica Nacional de Chile and the McGill Chamber Orchestra. Ishay Shaer was awarded first prize in the 2006 Newport International Competition in the UK, and a year later won third prize in the "Silvio Bengalli" International Piano Competition in Italy. In his home country, he has received several awards, including the prestigious Clairmont prize. In 2009 he was a prizewinner at the International Beethoven Competition in Bonn. Throughout the years, Shaer has been supported by esteemed organizations, such as the America-Israel Cultural Foundation and the Swiss Orpheum Foundation, being included in its promotion programme for young soloists. He began piano studies at the age of 7 with Mrs. Hanna Barzilai and later studied with Dr. Asaf Zohar. He studied at the Buchmann-Mehta School of Music of Tel Aviv University (in cooperation with the Israel Philharmonic Orchestra) with Prof. Tomer Lev and Prof. Arie Vardi, and finished his Bachelor's degree with distinction. He was also instructed by renowned artists, such as Daniel Barenboim, Vladimir Ashkenazy, Murray Perahia and Matti Raekallio. In November 2017, Shaer released an album dedicated to late works by Beethoven, with the British label Orchid Classics. The album has been played in prominent radio stations, including BBC Radio 3, France Musique and WQXR (New York), and was highly praised in music magazines such as the BBC Music Magazine and Codalario Magazine, where the critic wrote: "Fortunately for us, [Shaer] pursues the individuality of his sound and looks for his own interpretative lines … an interpreter attentive to details, who has a very careful sound and shows a wonderful understanding of the musical discourse ... This is an essential recording on the shelf of any music lover." In recent years Ishay Shaer has established himself as a reputable chamber music performer. He has played with Mischa Maisky, Quirine Viersen, Liza Ferschtman, Antje Weithaas, Simone Lamsma, Carducci Quartet, Bennewitz Quartet, the RTÉ Contempo Quartet and Aviv Quartet. His arrangement for piano trio of Beethoven's 'The Tempest' piano sonata has garnered praise and was described as "an immeasurably pleasing masterwork… sounded like one of Beethoven's finest trios" by Haaretz newspaper. Shaer's upcoming concerts include recitals (Piano aux Jacobins in France), orchestral engagements (withJerusalem Symphony Orchestra) and chamber music in the Netherlands.